Massage - mounted by Sarah Jane Szikora // £371.26 - 25% off. 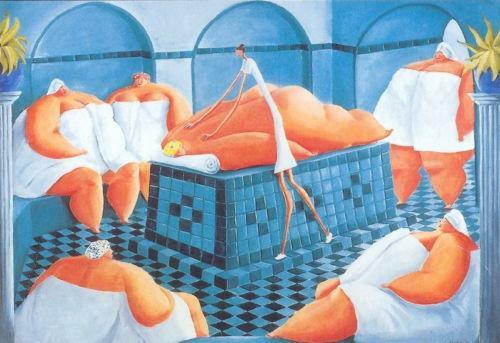 Szikora's signature distorted, exaggerated figures are ever present in ‘The Massage’ limited edition (this is a mounted lithograph) and once again a fantastically comical scene unfolds before us. Notice is the contrast in figures, the central elongated ‘super skinny’ woman masseuse, massaging a larger ‘super-size’ lady, while the others relax is the sauna and perhaps wait their turn! Putting a smile on all of our faces is something that Sarah Jane Szikora does best, as I'm sure you'll agree and this has brought about her success both in the United Kingdom as well as crossing the Atlantic, to the USA. What a wonderful quirky piece to add to your collection of Szikora limited editions.